A lot has been written about whether a letter of intent should be detailed or just cover economic points. Ruminations has added to that body of literature. So, we won’t repeat what we’ve written. That can be seen by clicking: HERE or HERE. A lot has been written about whether (or how) a letter of intent can become an enforceable agreement. Ruminations has added to that body of literature. So, we won’t repeat what we’ve written. That can be seen by clicking: HERE or HERE. People ruminate over whether they should do “this” or do “that.” Should the security deposit be two months’ worth of rent or three months? Should it cover estimated additional rent or not? What if this? What if that? Will someone else come along? Will someone else not come along? You get the idea. If you can’t decide, then ask yourself: Do you want a deal or not? If you want a deal, and you keep toggling back and forth, then it is a pretty good bet that either approach is perfectly fine. Sometimes, good enough is good enough. Momentum moves deals. And, time kills deals. There is literature touting the benefits of procrastination. But, procrastination is when you put off making a decision, not when you labor over one. 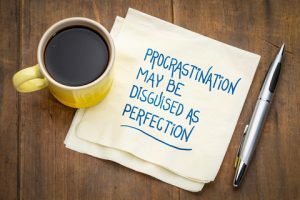 Interestingly, to us, some of the benefits of procrastination people write about support Ruminations’ philosophy of “decide and move on.” One such “good thing” about procrastination (we read) is that, by putting things off, a deadline for a decision is created. To Ruminations, that translates to leaving your school term project until Thursday night before the Friday it is due. Yes, those of us who passed through school that way rationalized that our “paper” was improved by starting on it the night before it was due. Age-driven reflection has taught us otherwise. But, there are other ways to create a deadline – just pick one – tell yourself that, by the end of the day, you will decide whether you are going to pave the parking lot for a new tenant. Liken the situation to one where there is no deadline for that school paper. Instead, the paper is due whenever you want to turn it in, but your teacher can announce the cut off time on 30 minutes’ notice. Surely, you won’t be putting off the paper for very long. When it come to all but national players (on either side), I advocate for the min-skirt. All too often, when attempts are made to address complicated legal concepts in the LOI, essential elements are too easily miss-characterized or missed altogether. And any attempts to negotiate legal concepts in the LOI outside of the context of the entire lease body (in which sister concepts not appearing in the LOI may define or clarify) inevitably lead to rehashing language that the parties thought had been settled in the LOI once the document negotiation is joined by the attorneys. I think that the purpose of the LOI is to see if the parties are on the same page with regards to the economics. It all starts and ends there. If there is no agreement on the basic number concepts, there is no point in talking about anything else.